A restaurant is a favorite if it earns repeat visits. 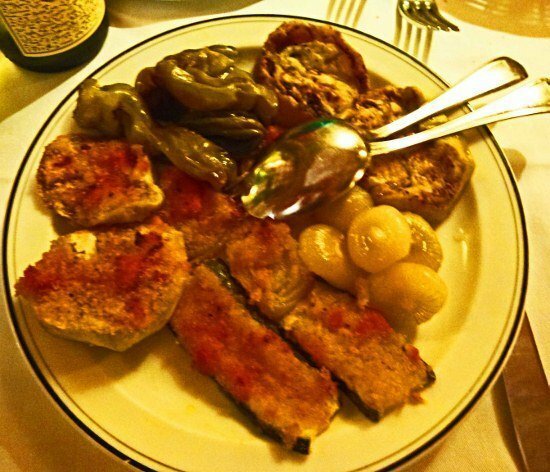 By that definition one of our top restaurants in Rome is Hostaria Costanza. We’ve been to Rome several times and on each visit we visit this small spot tucked away in a corner off the Campo dei Fiori. There are trendier places with more contemporary menus but Costanza keeps drawing us back. The setting itself is pretty spectacular. Costanza is built into a surviving portico of the ancient Teatro di Pompeo. 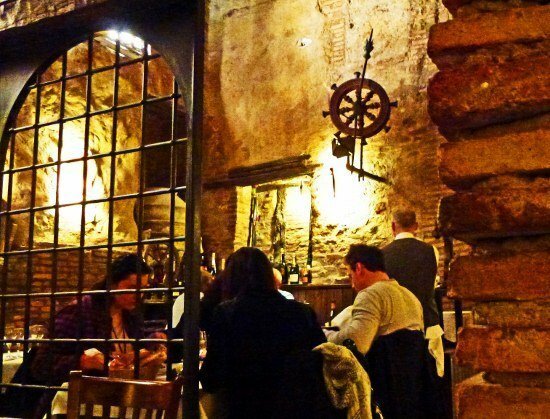 Vaulted stone ceilings that are two millenia old arch above the tables. If that’s not enough history for you, it’s also the spot where Brutus literally stabbed Julius Caesar in the back during the Ides of March in 44 B.C. The moody lighting helps recreate the atmosphere of ancient Rome. But the setting, eerily romantic as it is, isn’t what keeps bringing us back. It’s the food, a classic take on Roman cuisine. Upon entering the restaurant it could easily be mistaken for a delicatessen. That’s because the foyer serves the double duty of storing much of the food while at the same time showcasing the freshness of the ingredients. Experienced diners examine the food displays out front before venturing into the dining room. It reveals a sneak peek at the day’s specials that is far more evocative than any chalkboard description. In true Roman fashion, this anteroom also houses the antipasti table. Grilled vegetables, seasoned olives and sliced cheeses nestle temptingly on individual dishes waiting for one of the servers to pluck them out to create a customized antipasto for each diner. Select your antipasti from the tables out front. We credit Costanza with introducing our tastebuds to the joy of truffles. On our first visit we ordered cannelloni con funghi e tartufi as an appetizer, completely unprepared for the taste sensation that was to come; a rich earthy, nutty, creamy flavor. Suddenly we got it: this was why people rummaged through the woods or went to specialty food shops and paid exorbitant sums for tartufi. These cannelloni immediately made it onto our “Culinary Greatest Hits” list. Cannelloni with mushrooms and truffles. Our recent visit lived up to our expectations. The atmosphere of a perennial favorite was confirmed by the diners at the next table, two dapper Italian businessmen along with a distinguished looking priest. There was no way they were going to waste their palate on a mediocre restaurant. 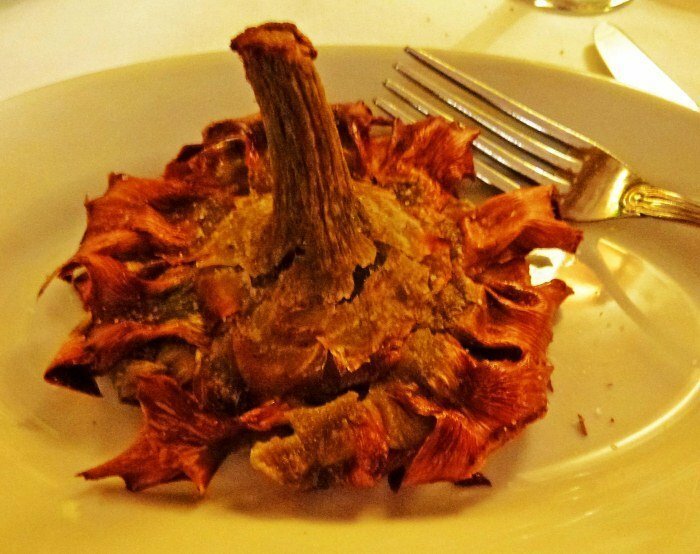 This time we took advantage of artichoke season to order an appetizer of carciofi alla Giudea, the classic Roman dish that originated in the old Jewish quarter of the city. Deep-fried until crispy and golden and garnished with salt and pepper, these beauties put potato chips to shame. 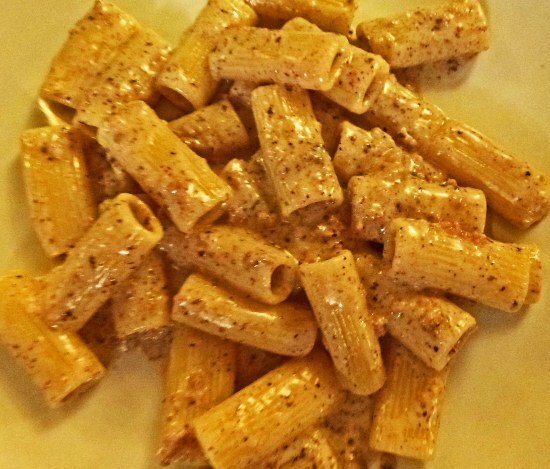 Rigatoni with sausages and truffles in a light cream sauce. Naturally for our pasta course we simply had to have truffles. The day’s special was rigatoni con salsice e tartufi, sausage and truffles in a light cream sauce. It was rich, but delicately balanced with not too much of any one ingredient. 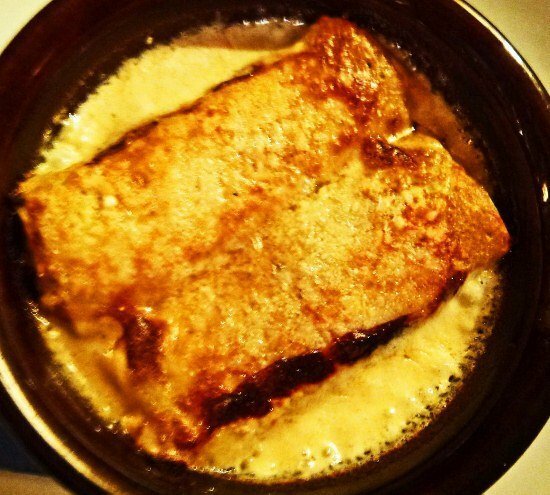 The cannelloni were made with fresh crespelle, or crepes. The flavors immediately took us back to our first visit, the way biting into a warm homemade chocolate chip cookie takes us back to childhood. We hope there are more visits to Rome in our future along with the requisite visit to Hostaria Costanza. Click the link to read about our soggy day hunting for truffles in Italy. We’re your typical middle-aged couple from Philadelphia who’ve been traveling the world full-time since 2011, seeking off-beat, historic and tasty sights. To receive monthly updates and valuable travel tips subscribe here.